Home » Meat » Eggs » What’s For Dinner? Welcome to another Urban Paleo Chef “What’s For Dinner?” post. So far this week, we’ve put together a couple of seriously exciting, and interesting meals. We started the week out with a Lime Herb Roasted Chicken, and Urban Paleo Chef Coconut ‘Slaw. We moved on from there to Baked Chicken Breast with Cilantro Sauce on Tuesday, and then yesterday we did a Carrot Ginger Soup. If you’ve been following along with me, you’ve had a busy week. And if you, like me, need to take a break from time to time from the complicated, but exciting meals, then tonight will be a pleasure. Tonight, we’re doing Breakfast For Dinner! The picture above was selected from Trialx.org, located while I was searching for a decent picture of a fritata (I don’t have a good one of my own yet). The Urban Paleo Chef (UPC) Twisted Greens can be pre-made and set aside. In a salad bowl, add all ingredients and mix. This side salad is quite simple, and quite tasty. It will compliment the “Greek” ground beef very well. This is similar to a full salad meal recipe I make called the “Twisted Salad”, but as a side salad, I will use fewer ingredients, and will tone back the flavors a bit so that it’s not too primary in it’s flavoring. That said, if you want to scale up the flavor a bit, feel free to add any of the following optional ingredients: Parsnips (chopped), Cilantro, Ginger. Again, the flavor of this side salad should be supporting, not primary for this meal, so use the strong flavor ingredients sparingly. Start the steak before the frittata, letting it cook longer on a low setting. In a frying pan, add a tablespoon of coconut oil and the steak. Cover and cook on a medium-low heat (3 out of 10). Now start the frittata. First, preheat the oven to the broil setting, or as close to 500 as your oven gets. While your oven is heating up, beat the eggs in a mixing bowl, adding a pinch of salt and pepper (as desired). Now heat up an oven-safe fry pan on the stove top, and melt the coconut butter in the pan. Chop the kale and sundried tomatoes, adding them to the pan as they are ready. Saute them in the coconut oil for about 3 minutes on a medium-low heat (3 on a 10 scale), making certain to get them well coated with the coconut oil, and fully warmed. Pour the egg mixture in to the pan, stirring immediately to ensure the kale and tomato are well mixed in to the eggs. Now leave this alone for 4 minutes, or until the egg has set fully on the bottom of the pan, and starts to firm up on the top of the pan. If you haven’t done this already, this is a perfect time to turn the steak. 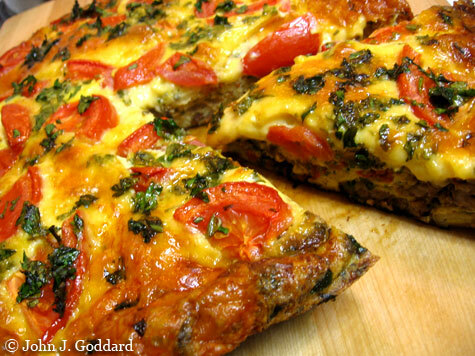 Turning our attention back to the frittata: There should still be a bit of liquid egg on top of the frittata. Now sprinkle the chopped parsley across the top of the frittata, making sure there is an even coverage of parsley. Place the pan in the oven to broil for about 3 to 4 minutes. It is ready as soon as the top starts to brown and crisp. Make sure to check regularly, because you don’t want this to overcook. Both the steak and the frittata should be ready at the same time. Serve the Twisted Greens first, and then the Frittata, as it holds it’s heat much better. Separate the plate in to thirds, serving the Twisted Greens in one third, and the frittata in the second third. The steak is served last, filling the remaining space on the plate. Now enjoy! For more meal ideas, check back weekdays daily at Urban Paleo Chef for “What’s For Dinner?”. If you have questions, comments, thoughts, or any recipes you would like me to try, please comment! Thank you for reading Urbanpaleochef.com! Only one word required YUMMY! Thanks Carl! It’s certainly one of my favorites! No cheese at all – and it’s great! I even tell you how to get that lightly crisped top, so that the meal you make actually looks like the pictures (and tastes like they look like they should taste too)! OMG that’s incredible because the picture totally looks like there is cheese on it! 🙂 Amazing work. My pleasure! I am a fairly strict Paleo chef, so all of my recipes are completely grain, bean, and milk free! I make an exception for alcohol, since I believe that alcoholic beverages are proof that there is heaven on earth – and there are so many wonderful things you can do when cooking with alcohol! I do occasionally cheat and eat cheese – but you won’t see me posting recipes on my site with them. So, browse the site with the secure knowledge that everything here is gluten free (and free from all grains), soy free (and any other bean free), and dairy free!